Music Together Big Kids is a 60-minute class geared to the interests and abilities of children age 5 to 7, and we find that eight and even nine year old children love and benefit from participation in the program. The program blends the elements of Music Together that parents and children love with new activities, skills, and challenges that are developmentally appropriate for this age group. Big Kids classes lay the foundation for Basic Music Literacy, complementing music instruction in school or instrument lessons, and leading to a lifetime of joyful music-making. The curriculum includes solfège, solos and ensembles, folk dances, harmony singing, vocal development, and drumming. In a safe, fun environment, your child can experiment with new activities like conducting and improvisation, story songs, and game songs. Your child will also learn important life skills like leadership, decision making and teamwork at the same time as he or she builds their musical skills. Parent attendance is welcome but not required. 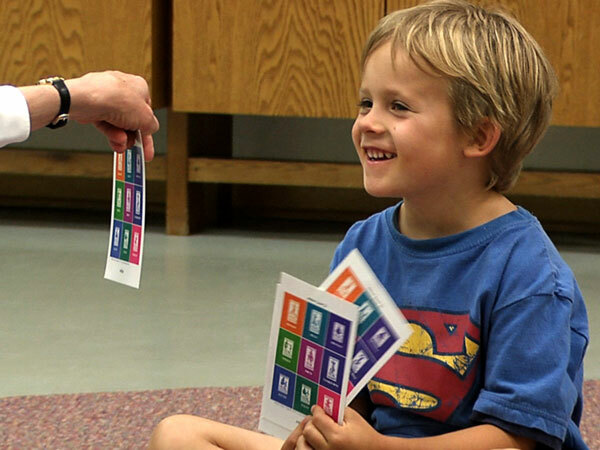 Each family receives a Big Kids songbook, 2 CDs, solfège cards, and HomePlay activities, so that the entire family can continue the fun and learning at home and parents can stay connected with what the child is learning in class. Enrolled families will also receive a code to access Music Together's Family Music Zone. There, you'll be able to download the songs from the current song collection, in addition to exploring fun content created just for you. To access the Family Music Zone, parents ( click on current family tab) will create an account at https://www.musictogether.com/ using the code found on the inside back cover of the CD booklet.